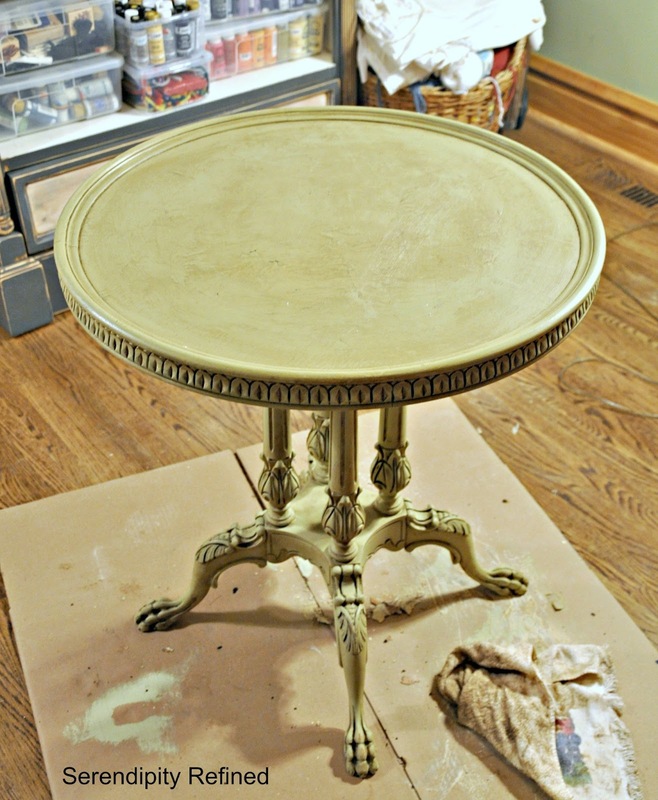 On Friday evening, my friend Janet and I performed a chalk paint update on her bedside table and lamp! 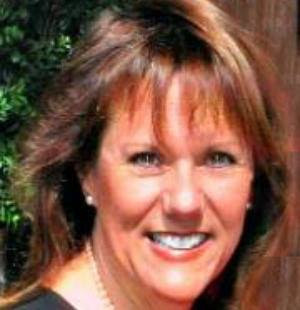 Unlike Nancy, the new friend who I met for the first time last week when I showed up at her door for Free Help with YOUR DIY Project #2, I've known Janet since we were in high school. After graduation, we lost track of each other for a couple of decades and reconnected a year or so ago but I hadn't seen her since we were both wearing white caps and gowns on a sunny Sunday in May in 19-something-or-other. 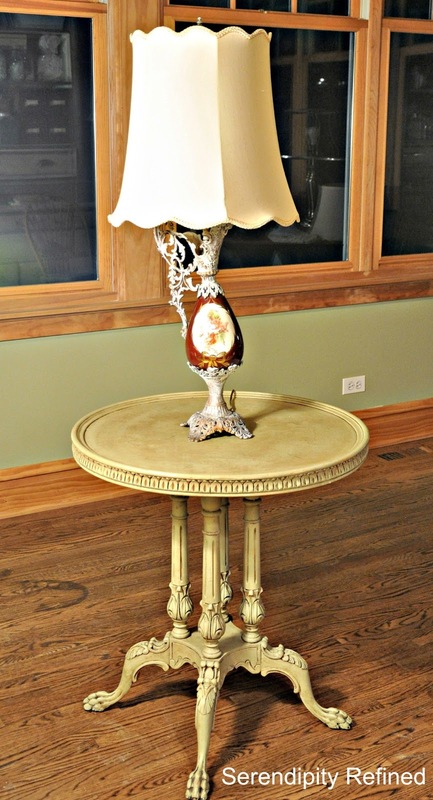 The table and lamp that we transformed had belonged to Janet's mom, a lovely lady that I got to know "back in the day" since she worked at our school. 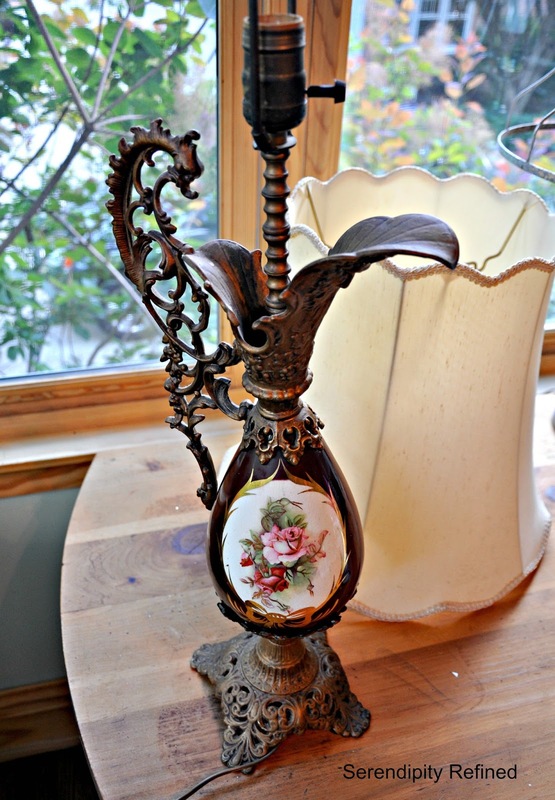 The pieces came to be in Janet's care a year ago at her mom's request, just before she passed away. These pieces have special meaning to Janet and I wanted to be certain that we didn't change them so much that they would lose their identity in the process of updating them. As you can see from the photos, the top of the table was in pretty rough shape. Water damage had taken a toll on the veneer. 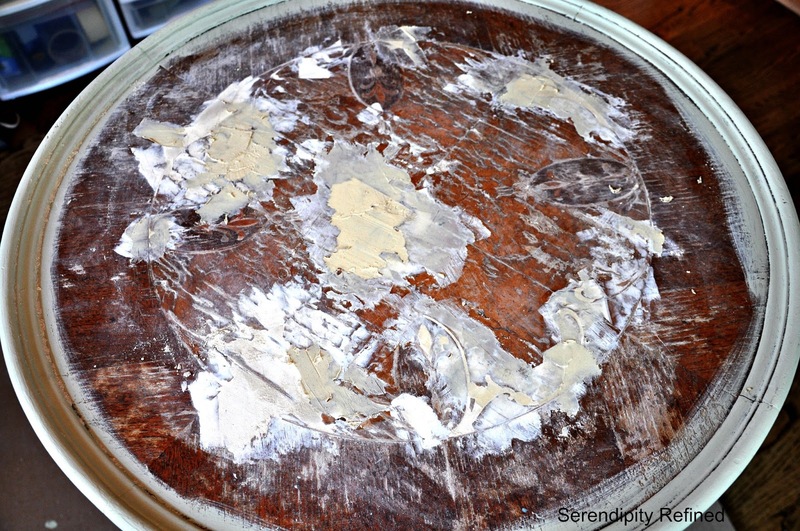 After some discussion, we ended up scraping the severely damaged veneer and and patching with wood putty to level the top of the piece. The detail and design of this little table are beautiful. Even the original color was pretty, but the "Versailles" chalk paint that Janet chose will blend much better with her decor. 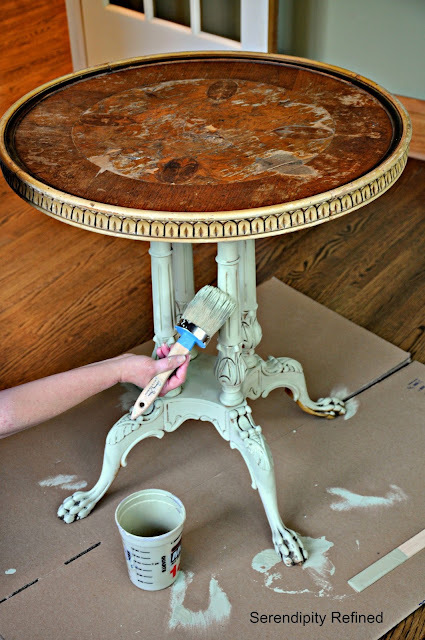 I handed Janet the brush and answered her questions as she painted the piece with two coats of ASCP "Versailles". 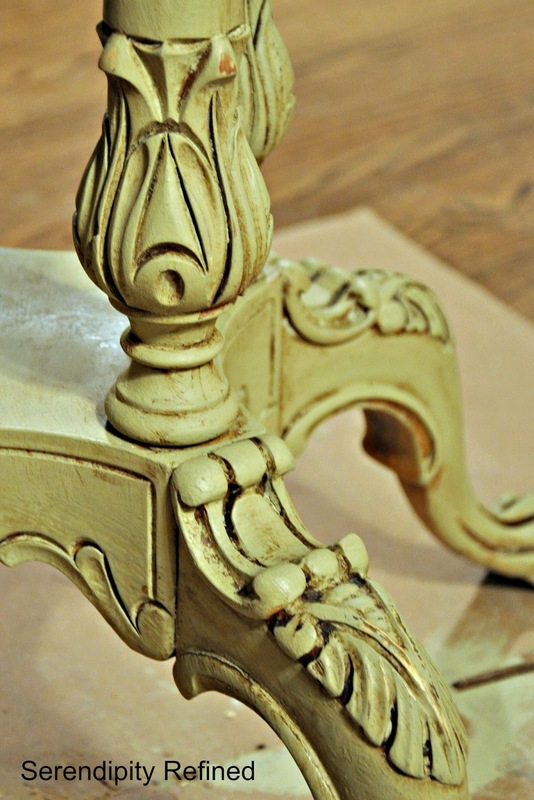 When the paint was dry, we distressed it with a medium grit sponge sanding block and then waxed it with dark wax. Janet said that she especially liked the way that the color is fresher but that the original feel of the piece is preserved...I have to admit, I completely agree! Don't you?! I love the way that parts of the original yellow and gold show through the paint. It's such a gorgeous detail. While we were waiting for the table to dry, we turned our attention to her fabulous pitcher lamp. 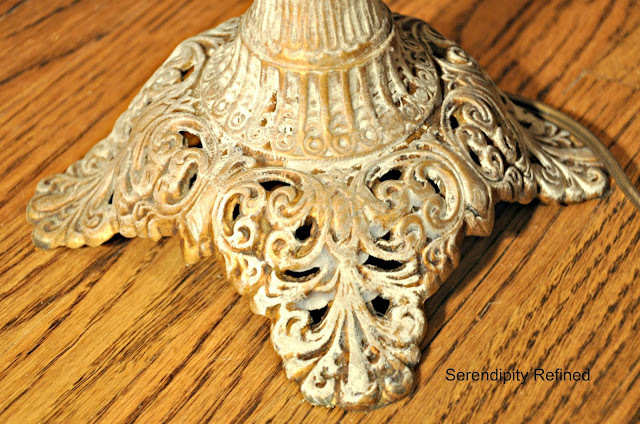 We quickly dusted the lamp shade with a brush and decided that, since it was still in really nice shape, we'd re-use the shade without changing it. Then, we simply dry brushed a little ASCP Old White on to the gold metal parts of the lamp and wiped most of it off immediately. We sealed the painted parts with clear wax. 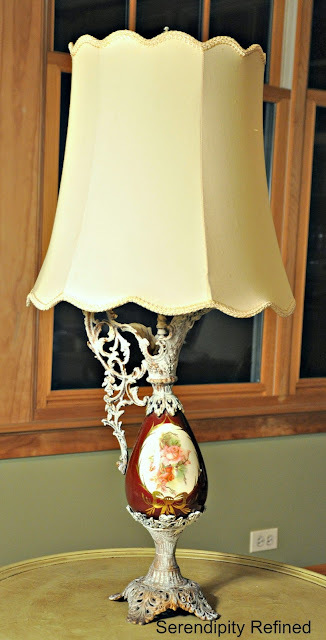 The frosting of white paint gave the lamp a lighter feel and made it appear almost lace-like. 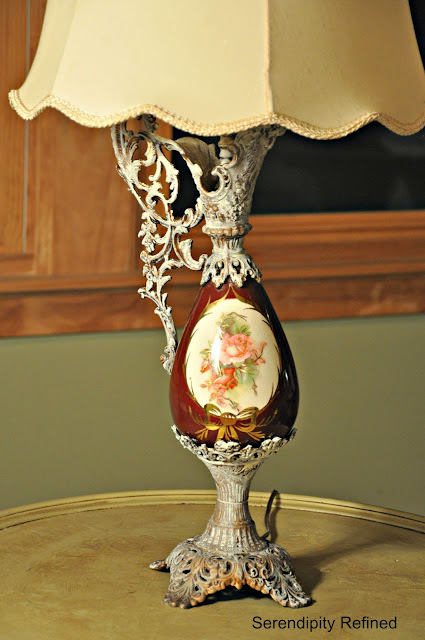 It's much softer and the contrast between the dark burgundy ceramic and the metal parts of the lamp is less harsh. 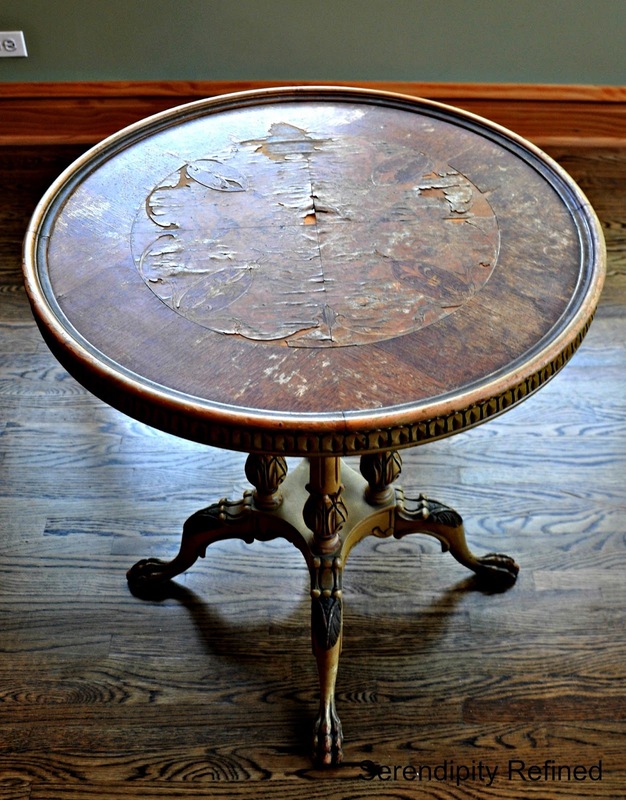 Of course, it's also beautiful with the table. ...even if it's been years since they've seen each other. Little did I know, when I offered to do this "free help" for others project, that the person who would benefit the most from it would be ME! Here it is! 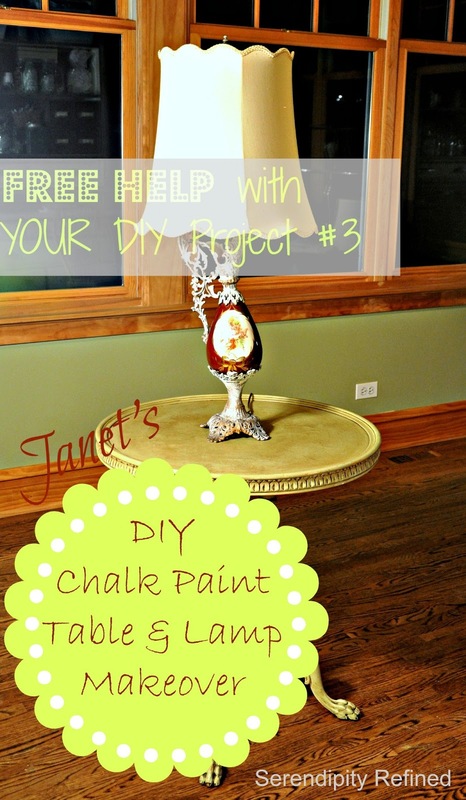 Janet's Versailles chalk paint table makeover and Old White Lamp Makeover. I'm sorry for the quality of the last few photos, we ran out of daylight before we were finished. I had fun painting with my dear friend and I hope that we get to do it again soon! Janet, if you're reading this...I'm ready when you are!